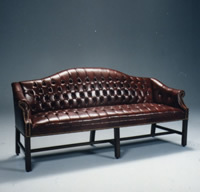 Wood, traditional 3 place, diamond tufted simulated leather upholstery seat and back. Seat measures 69” between the arms x 19” deep x 18” high. Overall height 45”. Designed to meet federal specifications 191-5041, 191-5100, 191-5304, CS-273-65 and California flammability regulation 117-75SEC. Brass nail trim, hardwood frame, decorative straight legs.